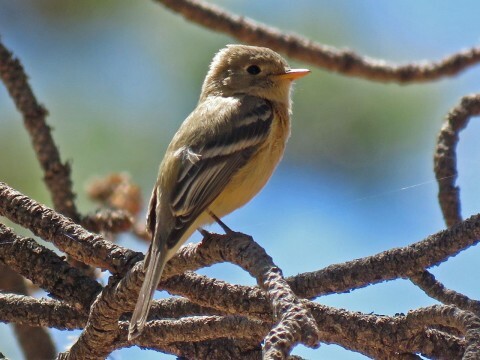 Carr Canyon for Southwest Wings "Spring Fling"
Well, the biggest story from our Southwest Wings "Spring Fling" tour was actually catching up with a mega-rarity: TUFTED FLYCATCHER! Unfortunately I didn't get a photo of that one, but we also had some great "regular" specialties for Southeast Arizona that were a lot of fun. 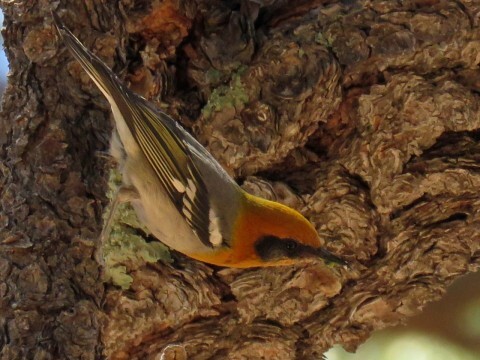 No sooner had we walked into the campground at Reef Townsite in upper Carr Canyon than we were hearing call notes and snippets of song from Buff-breasted Flycathers. This species has been reliable at this particular site for many years, but anecdotally I feel that the population at Reef Townsite has at least doubled if not tripled in the past 5 years. Glad to see them doing so well! 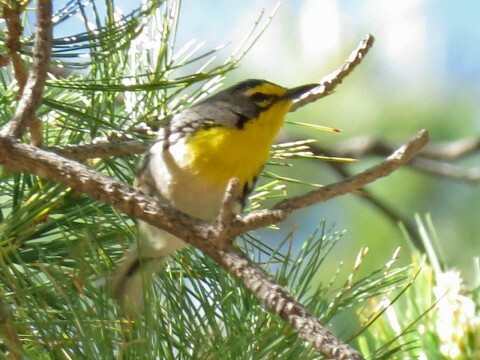 One aspect of Reef Townsite Campground that makes such sightings possible is that the pine trees here are not particularly tall, making birds like Grace's Warbler and Olive Warbler more accessible than in other parts of Arizona and New Mexico. 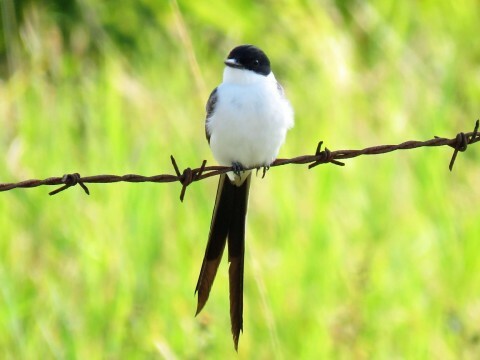 Now with a mega-rarity available (remember that Tufted Flycatcher? 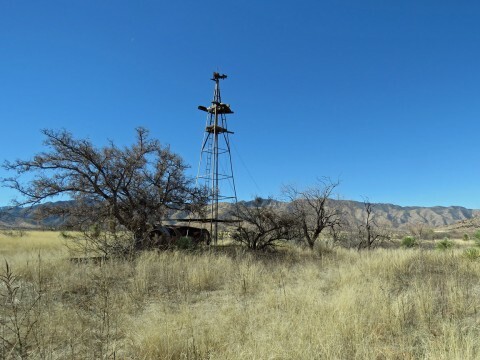 ), and with the road being in *relatively* good shape compared with years past, it might be a good time to consider a visit or re-visit to this birding gem of the Huachuca Mountains. 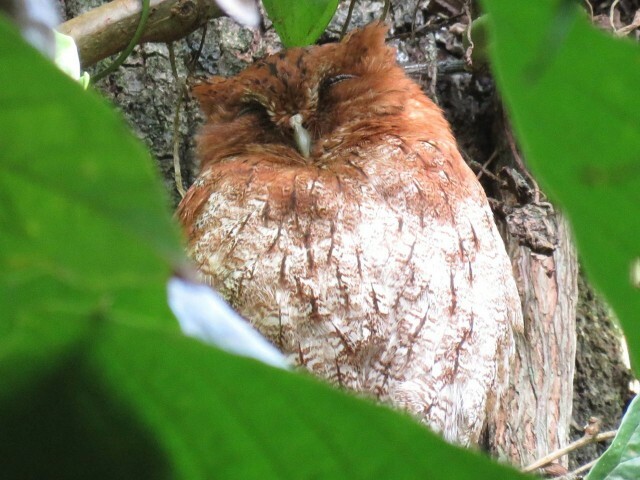 Being based at the Lodge at Pico Bonito has big advantages – hammocks on the porch of every cabin, gourmet meals and world-class birding right on the grounds. 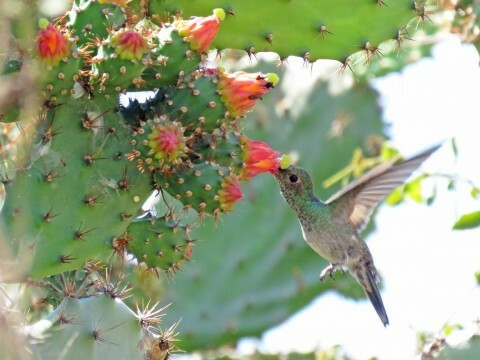 It does, however, mean that one full day must be dedicated to traveling for the only endemic bird in Honduras, a hummingbird called the Honduran Emerald. The best place to see the Emerald, and the closest to the Lodge, is a 2.5 hour drive to the arid thornscrub of the lower Aguán Valley. Fortunately, there are plenty of great birds to see along the route. We started off with a robust picnic breakfast of baleadas, fruit salad and locally-grown coffee in the town of Olanchito. No sooner had coffee cups been set down than binoculars were picked up! This Gray-breasted Martin perched obligingly on a wire near our picnic tables, affording a splendid study of the head and chest pattern. 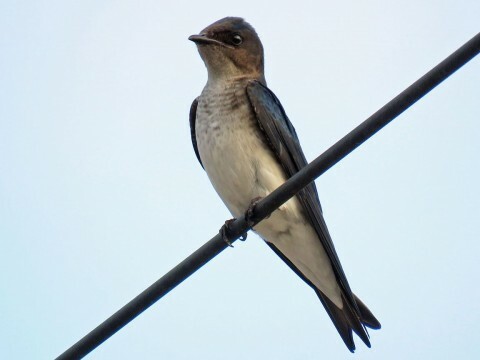 The uniformly dark head and sides of the nape separate this bird from the similarly-plumaged female Purple Martin. 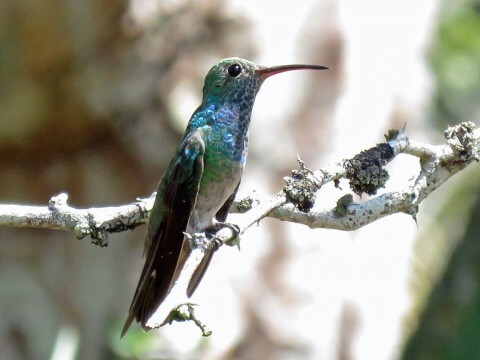 We all appreciated the chance to experience this unique habitat, and the contrast it offered to the rainforest of the north coast – not to mention a very range-restricted endemic hummingbird. Well worth the distance traveled! 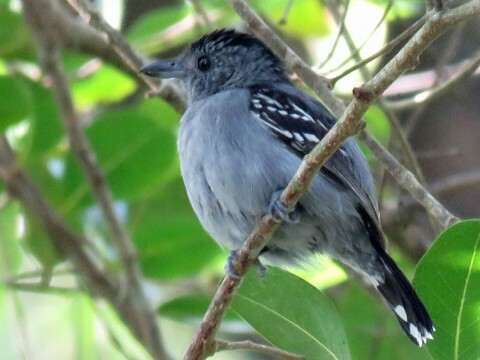 Antshrikes are known for their skulking habits, but this bird was more cooperative than usual. 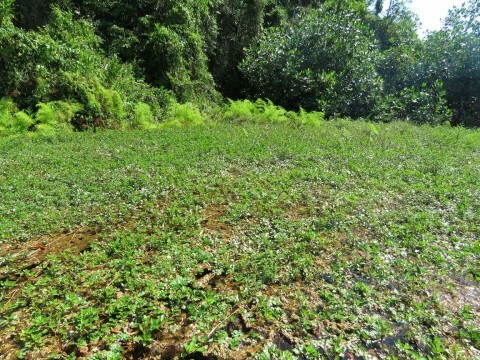 It probably helped that we were on a boat in mangrove forest instead of crammed onto a narrow rainforest trail where it could have more easily eluded us. The lovely midnight green band across the upper chest makes this a female. 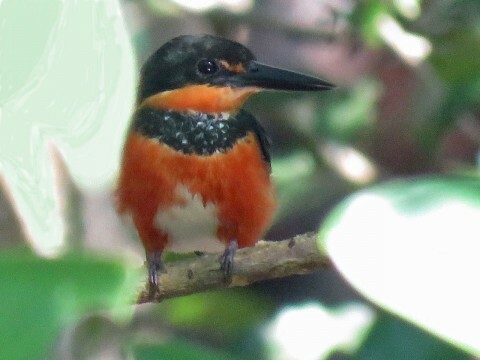 Pygmy Kingfishers often remain concealed in the shade of very low branches over slow-moving water. This bird was no exception, and it took some time before we were able to maneuver our skiff into just the right alley for everyone to catch a glimpse! 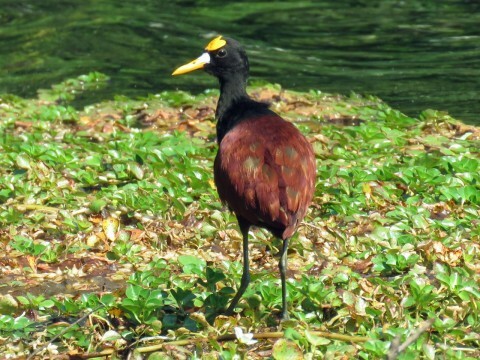 Northern Jacana, on the other hand, is a fairly common and easily observed bird of open tropical wetlands. 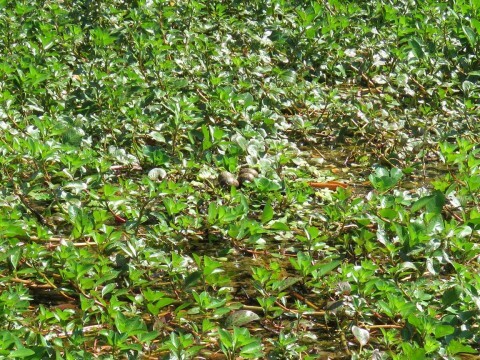 A true shock, however, came when our boat driver encouraged us to look a bit closer at the floating mat of vegetation attended by this Jacana. Amazing! This is the first time I've ever been witness to the NEST of a Northern Jacana! Quite a find on the part of our capitán. The Jacana foraged unperturbed about 10 meters away while we marveled at the pattern of dark chocolate drizzle across wood brown base color. 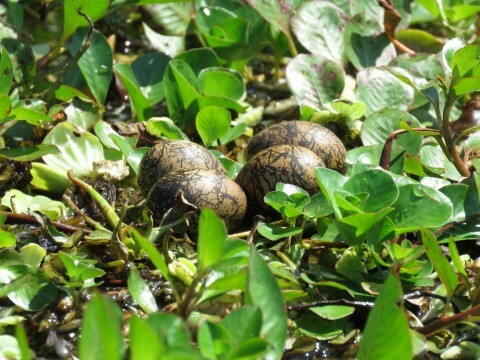 Unlike many species, only the male Jacana incubates the eggs. Pretty neat! Our tour to the Lodge at Pico Bonito in Honduras has been simply enchanting. Set in a verdant paradise for birdwatchers, at a luxurious eco-lodge where no detail in comfort (or dining!) has been overlooked, we're feeling quite pampered. And of course, the birds have not disappointed. One of our first highlights wasn't even of the avian variety! 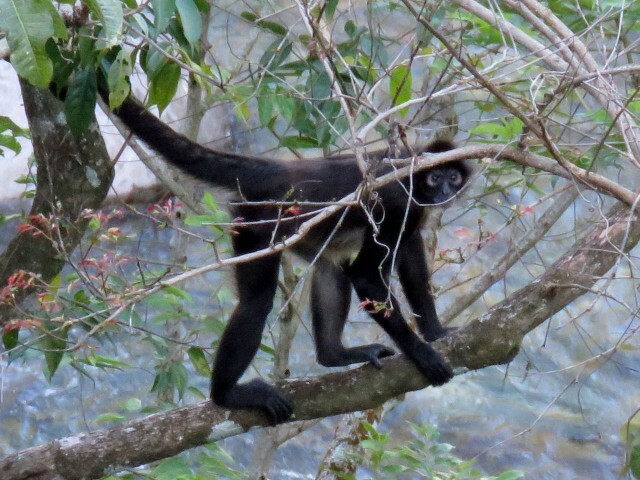 This Central American spider monkey, seen from the Toucan Tower, made quite a splash with the group. 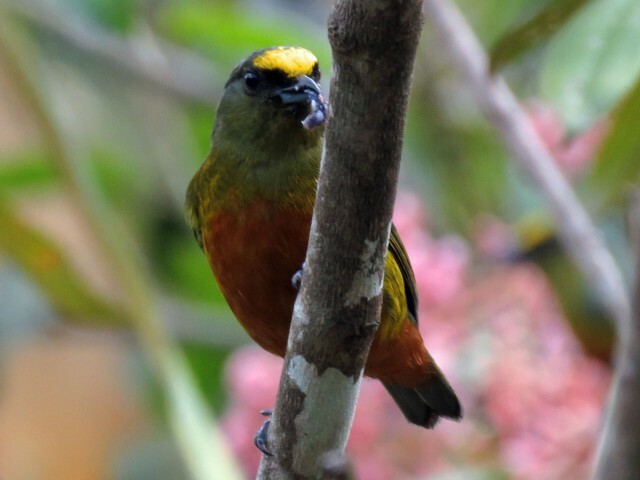 ​Back on the porch of the Lodge's restaurant (Itzama), Olive-backed Euphonia joined us at nearly every meal. 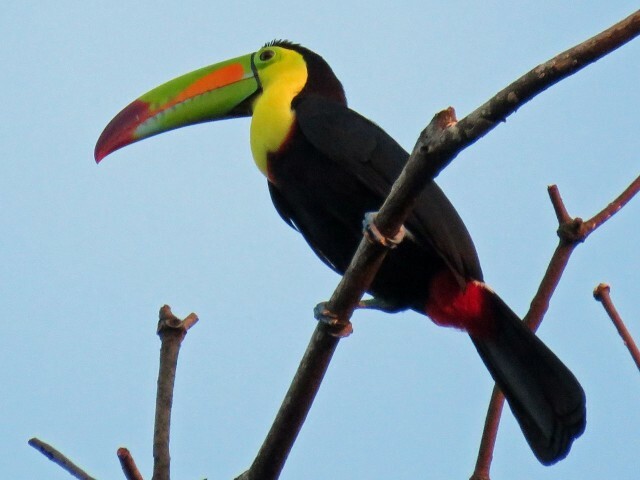 Keel-billed Toucan has been a daily treat, as well. In the afternoon, we took a walk just down one of the short trails at the Lodge. 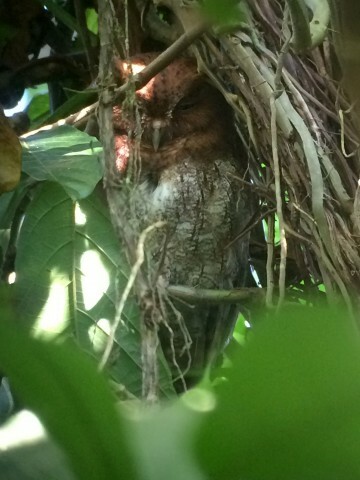 Elmer knew exactly where to look in a vine-enshrouded palm tree amidst a former cacao plantation for this delightful Vermiculated Screech-Owl (rufous morph). Believe it or not, that's just scratching the surface of an incredible first day in Honduras. Looking forward to the rest of the trip! Believe it or not, that's just scratching the surface of an incredible first day in Honduras. Can't wait to see what the rest of the trip holds! 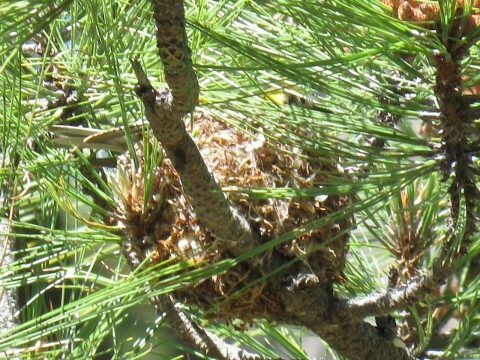 The pioneers knew that a good cluster of trees, often cottonwoods, meant water just underground. Naturally that was a good place to sink a well – especially if you had to dig it by hand! 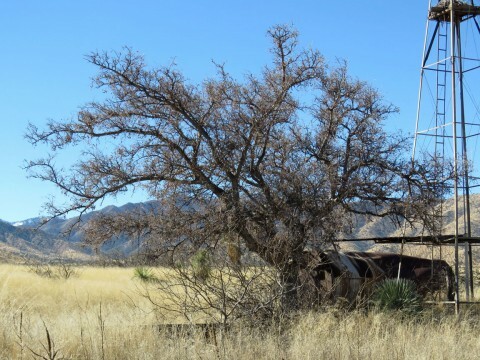 So, in western states, windmills are practically a signpost for "oasis." 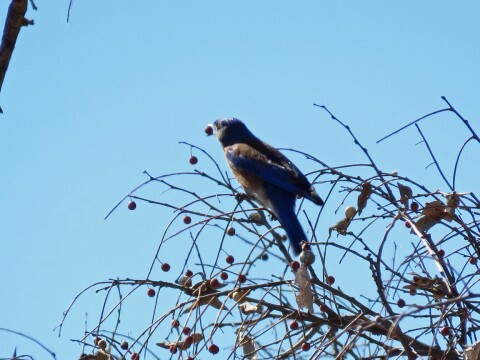 In this case, that was only a few hackberry trees, but sure enough this mini-oasis harbored a half dozen Western Bluebirds. Looking around, I saw nothing but arid grassland in every direction. 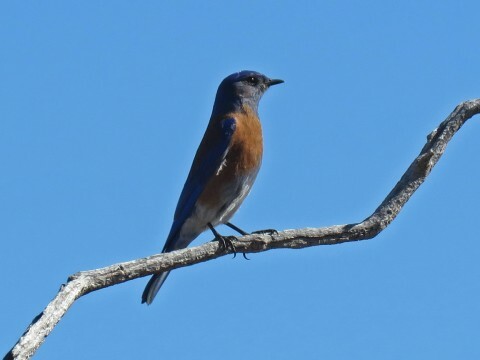 I think of Western Bluebirds as more of a forest species, but in the winter they do hang out at lower elevations where they can find adequate food and shelter. 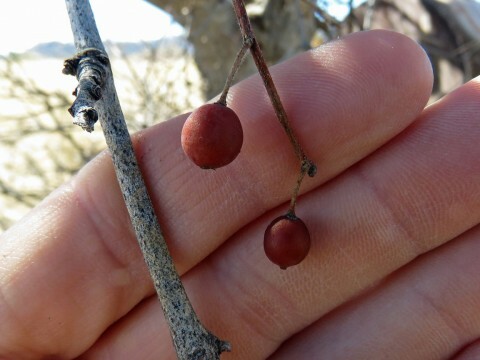 Netleaf hackberry (Celtis reticulata) is a great tree for all kinds of wintering birds, but in my mind hackberries = thrushes. Vagrant thrushes like Rufous-backed Robin are invariably discovered near hackberry trees or other fruiting trees and shrubs. So check 'em out! 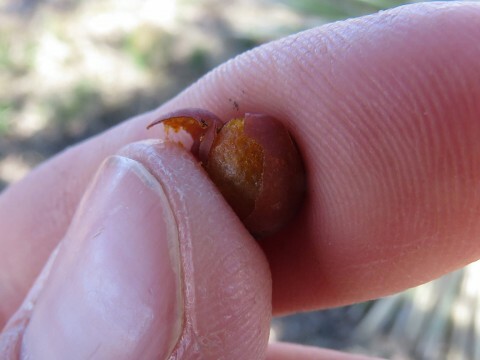 When you look at the pea-sized fruit up close, it doesn't look like much. When you crack open the endocarp, there's just a thin layer of mesocarp. Most of the berry is really just a seed. It must take a lot of these berries to fill up a bluebird belly! 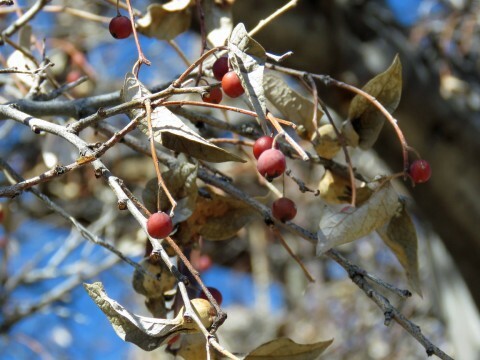 But, the fruits dry out and often hang on the branches throughout the winter, making them a reliable food source. And when they're newly ripened, they're actually somewhat palatable to humans, too. I don't recommend them by February, though...don't ask me how I know. Now that things have finally calmed down around the office, I decided to kick off October properly with a hike up Silver Peak. I'm lucky enough to behold this mountain from my living room window every day, yet I rarely have the few free hours needed to make the summit. Not wanting to waste this opportunity, the dog and I jumped in the truck and headed out. A fine day to be in the Chiricahua Mountains, and we had the trail to ourselves! With 4.5 miles of trail and 3000 feet of elevation gain ahead of us, we put our heads down and hiked hard. Even though I only birded for a few minutes at a time – while pausing to catch my breath – I still managed 33 species, mostly by ear. 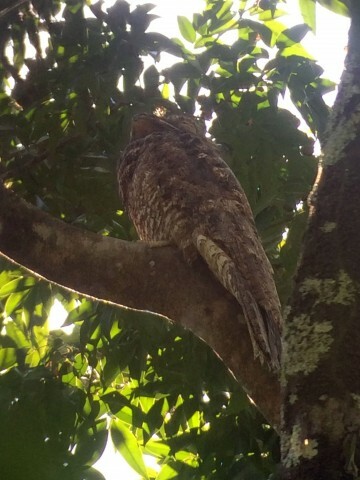 The clear highlight was a "Mexican" Spotted Owl on a day roost only 4 feet above my head, directly over the trail! Unfortunately, this doubled as a "lowlight" for me, too, since I didn't realize it was there until I had already walked beneath it, accidentally flushing the bird to an invisible perch around the side of a cliff... Major bummer. 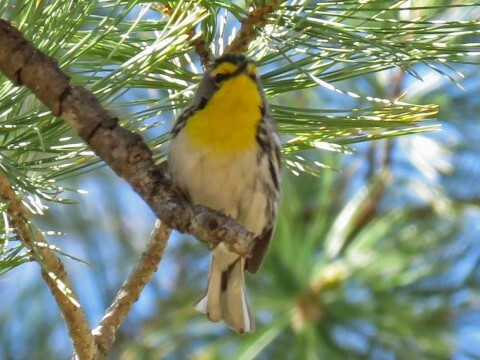 A consolation prize was a small songbird flock in almost the same spot on the return trip from the peak, which held singletons of Mexican Chickadee, Olive Warbler, Hermit Warbler, and Painted Redstart. My first-of-season Hammond's Flycatcher was an added bonus. 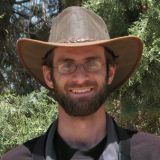 Checklist available on eBird. This larva of Automeris io turns into a pretty cool moth, but I personally think the caterpillar itself is a far more fascinating find! 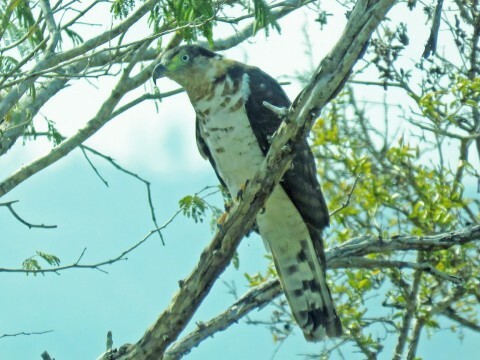 ​Just returned from a fantastic week scouting for my Honduras trip at the Lodge at Pico Bonito. This eco-friendly jungle lodge has developed a deserved reputation for both excellent accommodations and great birding, and I was fortunate to have the chance to experience it ahead of our February tour. Highlights were too numerous to relate here, but a select few that jump to mind are half a dozen Lovely Cotingas in view at once; eleven Keel-billed Toucans gathered in the same tree; displaying White-collared Manakins; and a very cooperative Stub-tailed Spadebill. If I was a better photographer, maybe I could have managed to capture them all in images! 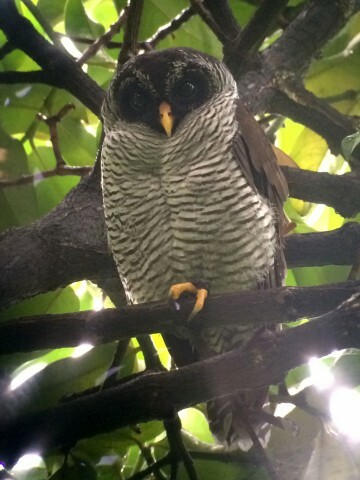 But the biggest treat for me was a suite of nocturnal birds on daytime roosts, thanks to Elmer Escoto, bird guide for the Lodge at Pico Bonito (see below). Looking forward to returning with the full tour in February! If you've had a chance to peruse the 2015 Borderland Tours newsletter in print, we hope you enjoyed the photos and updates! If you haven't had a chance, we thought it might be nice to upload the whole darned thing for convenient reading online. Please don't hesitate to get in touch if you have any questions about the content! You can view it online by clicking the images below or if you want a larger, printable copy and you have Adobe Acrobat Reader installed, simply CLICK HERE to download the PDF.